For this month's SRC, I was assigned to Ewa's blog, Delishhh, which is the perfect word for it since everything she makes is sensational. I especially loved looking at her Swedish recipes and still want to try making her Semla one day. But, for now, I decided to make her blueberry muffins. Not too long ago, I tried a different blueberry muffin recipe from another site and was extremely disappointed with how they came out. Those muffins were way too dense. 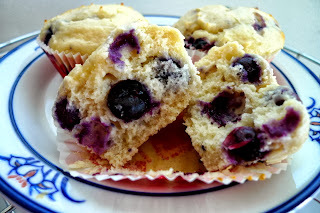 Ewa's muffins, on the other hand, were sweet, fluffy, and bursting with juiciness from the blueberries in every bite. They were delicious right out of the oven and just as delicious when they cooled. I would definitely make these again, and again, and again. Right now though, I'm off to go get some butter so that I can go and eat up the rest of the muffins in my kitchen. Thanks Ewa. 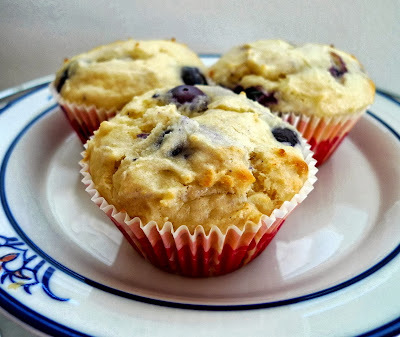 Your muffins made for one yummy Sunday morning. Preheat the oven to 350 degrees F. Grease a standard 12-cup muffin tin (or line with paper liners) and set aside. Whisk the flour, baking powder and salt in a medium bowl untill combined. Whisk the egg in a separate medium bowl until well-combined and light-colored, about 20 seconds. Add the sugar and whisk vigorously until thick, about 30 seconds. Add the melted butter in 2 or 3 additions, whisking to combine after each addition. Add the sour cream/yogurt or ricotta in 2 additions, whisking just to combine, and then add the lemon zest. Add the berries to the dry ingredients and gently toss just to combine. Add the sour cream, yogurt or ricotta mixture and fold with a rubber spatula until the batter comes together and the berries are evenly distributed, 25 to 30 seconds. Small spots of flour may remain and the batter will be very thick. Do not overmix. Using a large spoon or a cookie scoop sprayed with nonstick cooking spray, divide the batter amount the muffin cups. 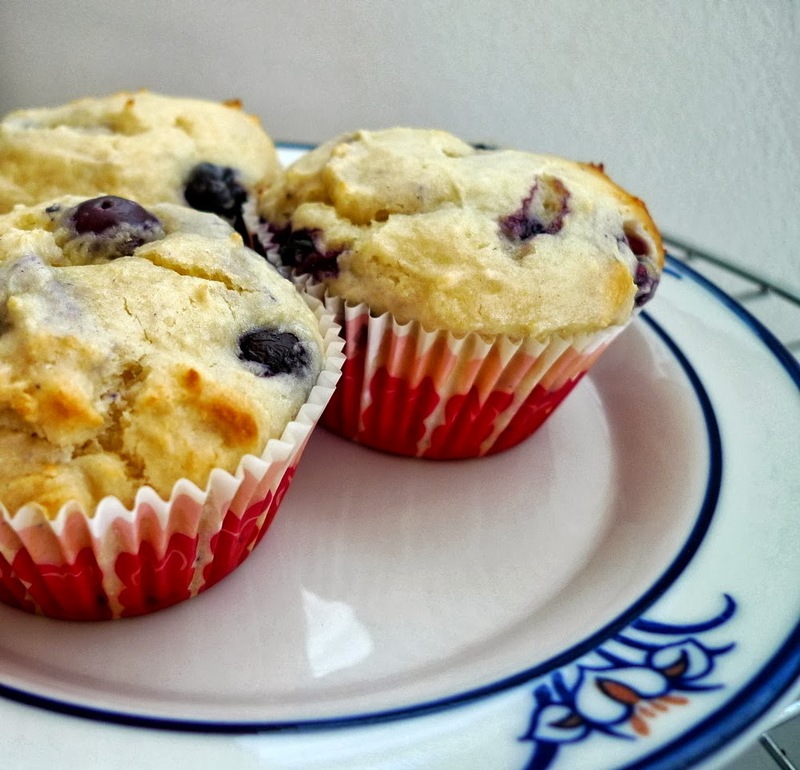 Bake until the muffins are light golden brown and a toothpick or thin knife inserted into the center of a muffin comes out clean, 25 to 30 minutes, rotating the pan from front to back halfway through the baking time. Immediately remove muffins to a wire rack and cool for at least 5 minutes. Serve immediately or at room temperature. Store leftovers in an airtight container at room temperature.